Never receive package/ stolen packages. If you need to have your order ship out the same day, you must call our customer service at 510-525-2328 (M-F between 9:00AM-2:00PM) to check if item is available to ship out the same day. We charge a $10 expediting fee. Customized items, Polymer and Li-ion battery pack, might take up to 2-3 weeks for assembly and testing. Please bear in mind that shipping times within US (UPS/Fedex)represent the time it normally takes packages to arrive from the day of shipment, not the day of submission, and do not include non-business days (i.e., Saturdays, Sundays, & holidays). Thus, for example, an order for UPS/Fedex 2nd-day delivery placed on Thursday could take until next Tuesday to arrive at its destination, assuming processing is completed within 24 hours and the package ships out on Friday (Friday + 2 business days = Tuesday). It could take longer if the order cannot be process in time to be ship out on Friday. For orders placed on Saturday and Sunday, most of them will be ship out on Tuesday since large amount of orders come in during weekend. When the items have been shipped out, you will get a notice via email. So please make sure to provide a valid email account. 2. We do generate the shipping label prior to shipping the order. Even though an UPS/Fedex tacking# is available to you , it does not mean the order is ready to ship out. 3. Our shipping label are automatically generate by our system. If you want to use your own UPS/Fedex account, we need to do it manually and there will be $10 handling fee for that. 4. We don't use USPS to ship item due to USPS does not provide a good tracking system. However, if you still prefer to use USPS to ship then we are NOT liable for any damage/ miss shipment and we will charge you $5.00 + whatever USPS shipping cost for handling this. Important: If your order contains Li-ion battery, Lithium battery or polymer battery, we cannot ship by USPS. It has to be UPS or Fedex. If this is acceptable to you, you can just place order using UPS/FedEx and then we can refund you the difference using USPS to ship to you. Please enter on the comment section - ' I like to use USPS to ship and willing to accept the risk of loss or damage shipment.' Also, please send me email with your order # so I can follow up for you. 5. UPS/Fedex pick up packages at 4:30pm every business day. The carrier will update the tracking information 24 hours after they received the packages. That means if you received the shipping confirmation by email on Monday evening, you can check the status of your packages on Tuesday evening. 1-15 days depends on your choices of (UPS / Fedex), Please note not all above services are available depends on your country and locations. Once the order is picked up by UPS or Fedex, we are neither responsible for, nor able to pre-determine, customs taxes and duties collectable at the receiving end. (Fedex / UPS standard to Canada will be charged additional custom and broker fee. Here is the reference for Fedex duty & tax, Fedex fees, and UPS Rates for Customs Clearance into Canada. For the most updated and accurate rate, please call UPS or your custom. ). Customer is responsible for paying all such amounts as may be requested. If you don't want the package, we will abandon the package and no refund will be issued. After the order has been shipped, you can track shipping status at UPS/Fedex website. 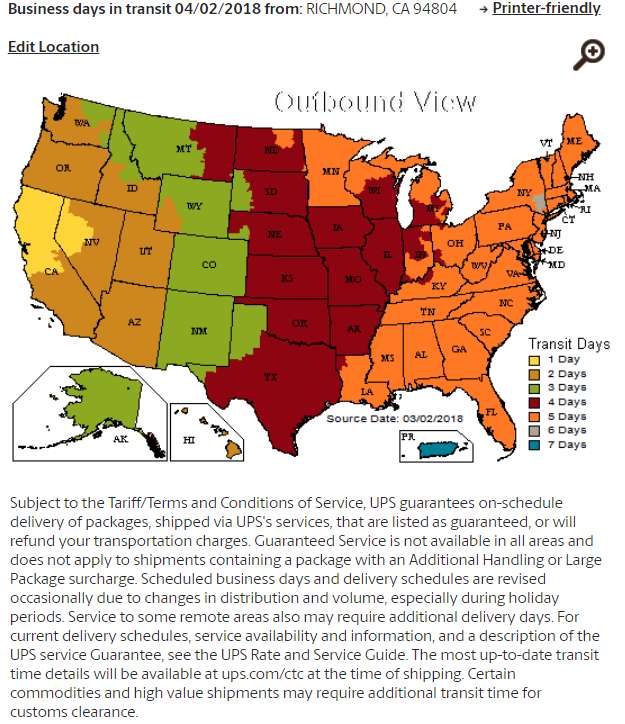 Q: Ground Shipping Time by UPS / Fedex within United States. Q: How to calculate my shipping fee? International customers -- Please process check out first, enter your shipping address, before make the payment, the estimated shipping cost will come out. We don't accept customer's carrier shipping account. Q: Never receive the package/ stolen packages. Please use the tracking# check at carrier's website, if tracking information shows that the package has been delivered and you are sure no other family members get it , please call UPS / Fedex to speak with agent to report and file a investigation. It will take around 10-15 business days to investigate. If the carrier finds the package, they will ship to you, if they can not, we will send the same packages or issue a store credit after UPS's verification . Please note that it is not our responsibility for the lost packages. Hazardous Materials Shipping Regulation. Due to the Department of Transportation's regulations for shipping Lithium battery, there is an additional hazardous material handling cost that UPS / FedEx charges "per box" that is NOT included as part of the shipping cost. To make sure your packages can be shipped without delay, please also add this into the shopping cart accordingly for Li-ion/ Polymer/LiFePO4/LiMnNi battery. *If we didn't indicate the cell / battery is UN approved, it has to be shipped by Ground only with special Hazmat fee. 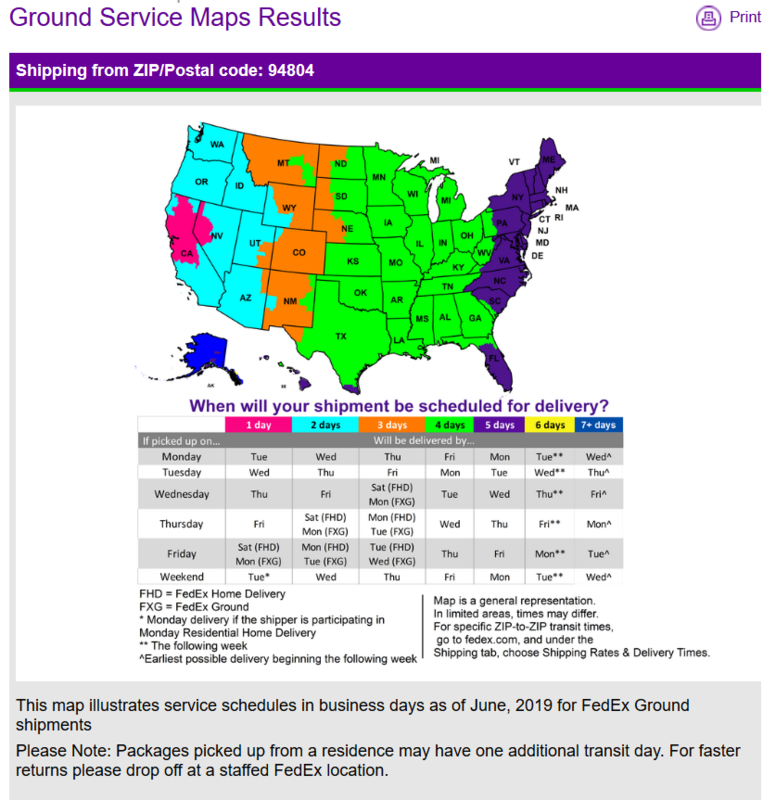 Please choose UPS/Fedex Ground only and add Ground Haz Mat fee. All Haz Mat shipment might be delayed due to shipping carriers check points. Delivery time can not be guaranteed on all shipping method. This fee is for one package only, if there is more than one package needed, we will contact you.